Just like a well-made suit, the Yurbi App works best if it’s tailored to you. The Yurbi App is like a bridge, connecting your business users with the data stored in your database. For the Trekkies out there, you can also say it’s the Universal Translator. The Yurbi App converts the raw data in your database into the terminology that your end users understand. In technical terms, the Yurbi App is an application layer semantic layer that is built on top of a metadata layer to translate the database schema and transform the raw data into a common user terminology (whew, that was a mouthful). In the Yurbi model, you create a semantic layer that lets a user generate an unlimited number of reports once the Yurbi App is configured. This is unlike traditional SQL report building where you write a query per report. What is a perfect Yurbi App? To build a perfect Yurbi App you need to have an understanding of not just the underlying database but also the way in which your users need to use the data stored in that database. 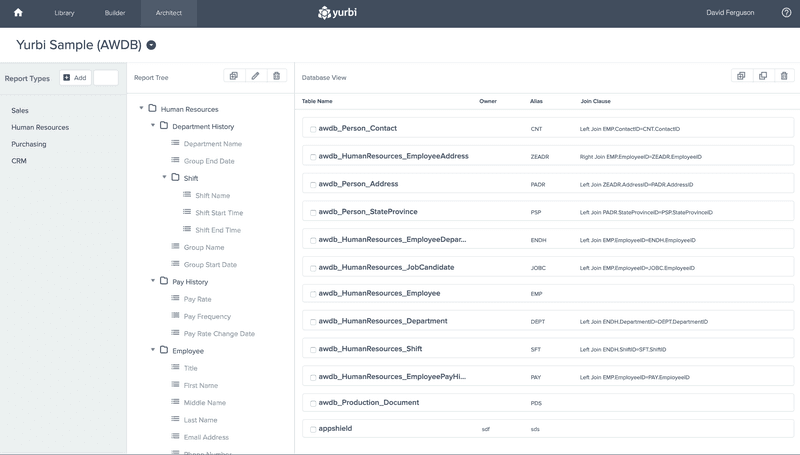 The Yurbi App is made of report types, database fields, calculated virtual fields, and the relationship of the database tables they reside in. Yurbi translates these pieces of raw data into meaningful information for your company. And also allows them to create powerful ad-hoc reports without needing to know how to write any SQL queries or code. It allows a growing company to have one central location to access all their database information in a personalized, self-service environment. While building reports using the Yurbi App is codeless, building the Yurbi App does require some technical expertise. You can find more information on the basic steps of building the app here. How can the Yurbi “Done For You” services help? However, beyond the technical pieces to the Yurbi App, the piece that is equally important is the understanding of the end user needs. To build your Yurbi App to its full potential, you need to understand the business use cases for that data, and the fields that users need in order to generate reports. This step is less technical and more case and reports driven. The security needs of an organization also greatly drive the Yurbi App construction. Our team has the experience and knowledge of best practices on how to structure the Yurbi report types, report trees, and database joins which is where the app should be personalized to the audience, to optimize the usage for your business. In some cases, the creation of database views can make reports execute faster. For clients that are importing Microsoft Excel or CSV files, multiple different files can be crafted into a single Yurbi App to build a powerful reporting app from your raw spreadsheet data. This is just another example of making the app fit your needs, and really work for you. For partners, we can also develop an app for your software as a service, or an on-premise application that can be packaged and reused for all your customers, and deployment with canned dashboards and reports that work out of the box. Having a well-built app is the key to a successful Yurbi deployment and allows you to utilize Yurbi’s services to its full extent. We can become an asset to your team, to fill the gap in database expertise, in order to create the perfect Yurbi App for your business. If you already have that expertise in your organization but want to leverage our expertise to ensure the best Yurbi App for your environment, contact us to discuss your specific requirements, we are here to help.